I'll be honest, this is more a heartcanon, i.e. I desperately wish this were true, more than a headcanon, i.e. this logically makes sense from what canon tells us although it's not confirmed. Let's see if I can convince you. Image taken from the Game of Thrones show, clearly contradicting my heartcanon. Valyria and Old Valyrian seems to be an analogue for fallen empires like the Roman Empire (and its posh Latin). But from the books, there's some flimsy evidence that my heart clings to. 1. Valyrians can't all have Targaryen white hair and purple eyes. Targaryens were quite picky about their marriage partners, since they wanted to keep the bloodline pure. Sounds as if they wanted to retain the white hair purple eyes anime combo, but this also works if they were an entirely different race. Why skin colour isn't mentioned, then? 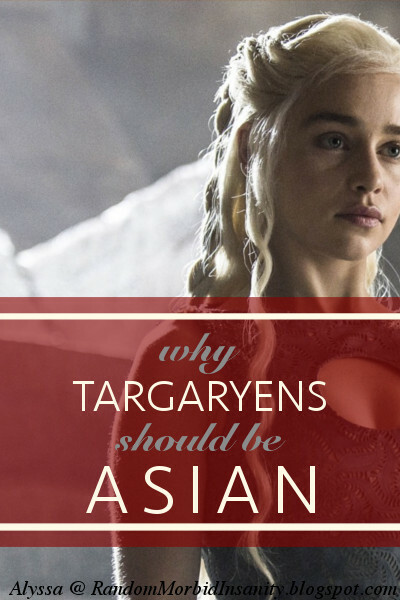 Because the Targaryens are albino, at least partially. Purple eyes, no matter what Anne of Green Gables have told you, are not that common. Some reading on the Wikipedia article of albinism suggests that it may be possible the Targaryens have pale blue eyes such that they seem violet in some lights. Since one Targaryen in hiding dyes his hair blue to make his eyes look less purple, it's highly likely the Targaryens had albinism. So if we claim that the Targaryens were typical Valyrians, we're suggesting an entire country, and a once-powerful and far-reaching one at that, was composed entirely of albino people. This is unlikely not only because albinism is recessive, but also because of the medical complications that they're more vulnerable to. Whereas if we suggest the Targaryens happened to be albino, while Valyrians were Asian, we can retain the logic for "the blood of old Valyria" boast, mend a setting-hole of Valyria, and justify why the Targaryens escaped the Doom: they weren't welcome in Valyria. However, they still had enough pride to intermarry instead of being merged into the Westerosi. 2. Valyrian steel comes from Eastern swordsmithing. Valyrian steel is most distinctive for how it's folded over and over again. Think about real-life swordsmithing — folded steel is most heavily associated with Japanese katanas or Damascus steel (made in Syria with metals imported from India). The latter skill was in fact lost for a good chunk of history, just as how making Valyrian steel was lost with the Doom. 3. Dragons are more integral to Eastern mythology. Considering how we simplify many fairytales and folktales as "knight rescues princess from dragon", it seems that Western culture views dragons as evil or at least antagonistic. In books like The Hobbit or Voyage of the Dawn Treader, dragons are greedy treasure-hoarders, kind of like fire-breathing squirrels with snakeskins. That metaphor was unintended, I swear. My point is, Westerners don't like dragons. But Valyrian dragonlords ruled the place. While I'm not saying that they couldn't dislike dragons and still use them to stay in power, it seems more likely those in authority would seek to glorify dragons. So which cultures see dragons as symbols of power and authority? In China, dragons were associated with the emperor, and seen in a much more positive light. Draconic symbolism is extremely significant in Winner Takes All. Even today, some more pretentious Chinese will call ourselves 龍之傳人, aka descendants of the dragon. Does that not sound a touch like the blood of old Valyria? I'll admit Chinese dragons technically do not have wings, and Targaryen dragons do. Like I said: heartcanon. 4. Valyria made an impact on culture in nearby regions, but not Westeros. Westeros is more or less accepted to be the England or even Europe of the ASOIAF universe. As I mentioned in the beginning, most fans take Valyria to be similar to the Roman Empire and whatnot, which definitely had some effect on Europe all the way to modern times. Even after its fall, Valyria affects several Essosi cities. ... except Westeros wasn't much affected by Valyrian culture. Sure, the highborn speak High Valyrian and they all use Valyrian swords and a few idiots sailed off to the ruins, but it's not as if the Common Tongue was built on Valyrian, as English has stolen from Latin and Greek, or so on. Whereas in Slaver's Bay, geographically (and therefore probably culturally) closer to Valyria, many local customs such as gladiator-ing and dog meat-eating are quite different from Westeros. Now, the gladiator bit is very Roman, but most Western cultures would find eating dog quite odd. Where does that come from? Yeah, I'm thinking East Asia (at least? not very familiar with other Asian cuisines) again. If Westeros is the representation of Western culture — doesn't it follow that Valyria, and the other Essosi places, might be Eastern culture? Note: Yes, I'm aware this is full of holes. Feel free to poke it apart (kindly) — but the fact is, I'm just not satisfied with the mention of Yi Ti. Does my heartcanon convince you? How much power should fans have in deciding canon? Are you missing out on the bonus content I send my takeout army? Join us now to receive monthly letters of magic, madness, and murder!